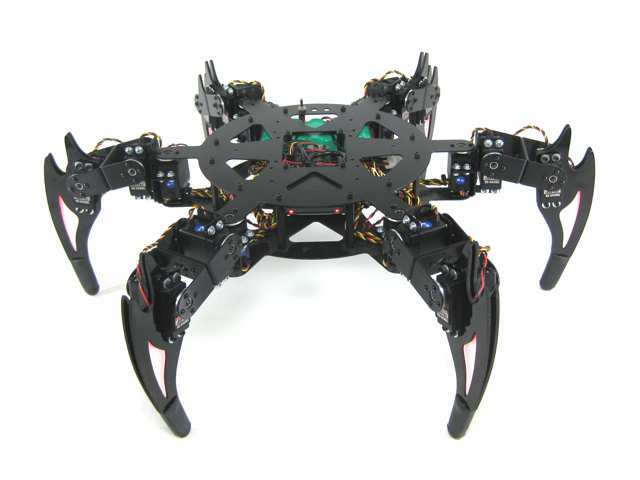 The CH3-R robot's round body symmetry makes this a very unique hexapod walker. The three DOF (degree of freedom) leg design provides the flexibility required to walk in any direction! The robot uses 18 HS-475 / HS-485 servos for the legs. The combo kit includes everything you need to make a functional robot except batteries. This is one of our most sophisticated walking robot offerings. It's truly amazing to see in action. This stylish version of our research level robot is perfect for the robotics hobbyist. The robot is made from ultra-tough laser-cut Lexan structural components, custom injection molded components, and high-quality aluminum Servo Erector Set brackets. The combo kit comes with the SSC-32, Bot Board II, and BASIC Atom Pro 28. By offloading the servo pulse generation and sequence movement timing to the SSC-32 the BASIC Atom has plenty of power to do some really cool things. The PowerPod program allows the robot to walk with variable speed, in any direction (translation), or turn in place (rotation), or any combination of the two. The leg lift and ride height is adjustable as well as the gait walking speed. There are preset walking modes for tall grass, tile floor, low profile and normal operation. You can rotate the body in every axis. There are also preprogrammed poses and a sleep mode. All of these are accessible from the controller. 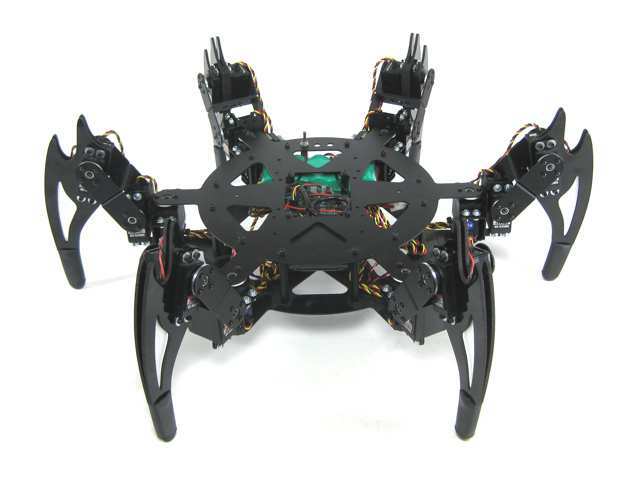 We recommend the wireless PS2 controller (RC-01) to get the robot up and running quickly. There is also a serial control mode for controlling the robot via a serial connection. With the proper configuration the popular Phoenix code (written by Jeroen Janssen (Xan on the forum). Thanks, Jeroen!) may also be used. PowerPod is the FREE Windows program that completely automates the program creation for the Atom processor. 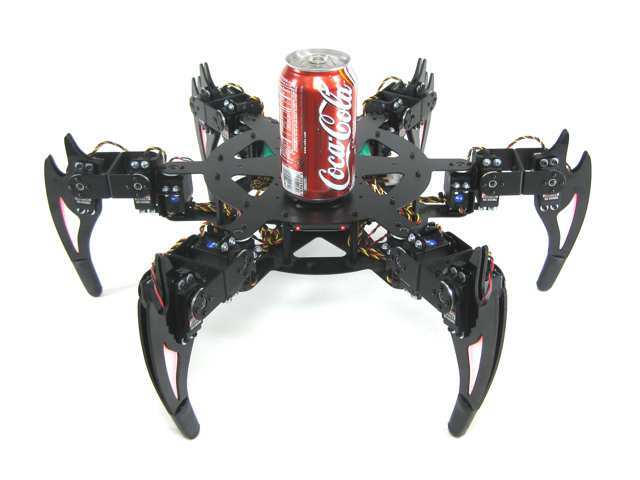 You no longer have to be a computer scientist to play with this level of robotics. The control options are: autonomous, PS2 remote control, RC stick radio control, and TTL serial control from a PC, PDA, or any other microcontroller. Powerful BotBoarduino/SSC-32; prewritten programs available. This product includes everything you need to build a robot to control using the BotBoarduino/SSC-32 with our PS2 robot controller (sold separately). This kit includes black brackets. Upgrade your lexan "C" legs to 1/8" black anodized aluminum with this kit. If you're building from scratch, you will need REC-06, PSH-04, and servos, which are sold separately. Note: The 3DOFC Leg Light Kit is NOT compatible with this aluminum "C" leg upgrade! This dual expansion deck has a servo mounting hole centered on the top panel. This allows mounting dual ultrasonic sensors for 360° coverage. Note, one standard size servo required.